This entry was posted in Uncategorized on March 6, 2008 by AstroNerdBoy. I just wanted to take a moment to wish everyone a Happy New Year! For me, I’m hoping that 2008 sees me converted to regular employee of The Company (despite its many faults) or else I’m out of a job come August. Plus, I would like to possibly score my own place rather than rent and take a trip to see my brother and his family and my sister and her family (which I’d for sure get to do with a conversion since I’d have actual vacation time). This entry was posted in Uncategorized on January 1, 2008 by AstroNerdBoy. A while back, I talked about spider and how an egg sac got hatched in my apartment (which you can read here). 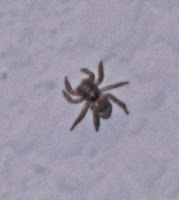 Five months later, I’m still finding these small spiders, including one earlier today. I’m not sure what they are eating being that its winter and all, with the last several days being bitterly cold. However, however many of them are left skulking around in my apartment, they are getting a bit bigger. This entry was posted in Uncategorized on December 31, 2007 by AstroNerdBoy. The other problem was the seed my friend Taco’s Rule put into my head a couple of weeks ago. We were discussing some games and he mentioned Elder Scrolls IV. So a week ago Monday as I entered the mall to drop off some eBay packages, I passed the video game store (having done so for several days prior since I had many things sold on eBay that needed to be shipped). So I went in and there the game was, complete with two expansion packs. I tried to leave, but it leaped on me from behind. Like a wild monkey, it screeched and clawed at me. In the end, I had to subdue it with a credit card and then had to take it home. Oh well. But, I did get some constructive stuff done, including steam cleaning the carpet in my living room and the carpet just outside the kitchen. Due to poor floor design, the stove is right next to the dining area. While there is a wall on the left side of the stove to help shield the dining area, grease can easily pop out to the carpet at the entrance of the kitchen. Not only that, but it is way to easy to accidentally track food into that carpet area. So it was pretty stained and now isn’t. The odd thing about cleaning with my new steam cleaner was the massive amount of carpet fibers that the cleaner pulled up. I honestly thought that with the amount of materials this was pulling up, I could start making a throw rug. That alone made cleaning up the cleaner afterward quite interesting. Well, tomorrow night sees me back at work. I would have enjoyed having another week off, but oh well. This entry was posted in Uncategorized on October 16, 2007 by AstroNerdBoy. The timing is off on this (and weird how the audio quality isn’t as good as an embed as it is on YouTube’s site but whatever), but its still funny all the same. I think the Government will be banning this video as it will clearly lead people to obesity. This entry was posted in Uncategorized on September 29, 2007 by AstroNerdBoy. This entry was posted in Uncategorized on September 27, 2007 by AstroNerdBoy. What cost $17500 in 1974 would cost $76711.31 in 2006. This entry was posted in Uncategorized on September 26, 2007 by AstroNerdBoy. One of the great things about where I currently live is that everything I need or want is withing a 4.5-mile radius of where I live. That includes a postal center in the mall, which means I have access to a post office until 9pm. That’s a big help, especially on a day like today when I had to drop off a ton of packages for an eBay auction I had. The great thing about eBay auctions is that once people pay, I’ve been able to print out prepaid postage for my packages, to include a delivery confirmation number. Even on overseas packages, I’m able to print out the proper forms, only needing the special envelope from the post office to place the forms in before shipping. That said, today I took a load of packages and padded envelopes to the postal center that’s at the back of a candy store in the mall. The elderly lady working the postal counter didn’t seem to pleased to see me. She seemed even less pleased when I told her everything save for a package to my brother had postage on it (via those nifty labels I printed) and that I had one overseas package that required a special envelope. I handed her the padded envelopes (each containing a single DVD in case) and then she grabbed all of the packages, save for the one on the bottom which I held onto because it was going overseas and the one for my brother. What? I know she’s referring to my prepaid postage labels but I have a package that I have to pay for and another that required her to provide a special envelope to stick to the package. Sheeze, lady. OK, I’ll just play this off because she’s old and the word “computer” likely gives her a panic attack. As she attempted to take care of the other gentleman (and was doing it wrong apparently), I noticed that two of my customs forms were missing somehow. I was annoyed with myself for not double-checking that before the old lady took the packages. Then I realized that two of the sheets were likely still stuck to the back of another package due to static electricity. When the gentleman had finished his transactions, I got the old lady’s attention and asked her about the customs forms. She was reluctant to check the postal package bin because she was sure there were no papers placed there. Well, sure enough, one of the pages was stuck to the back of another package, but the old lady couldn’t find the other and wouldn’t do any real looking. I know it was there because all four sheets had been together, but the old lady had turned into a jackass and begun to brey and snort. Well, I was an idiot for not ensuring I didn’t control the hand-off of packages to her and thus keep the customs forms segregated. I paid for the package for my brother, which also seemed to annoy her, and then went home to reprint the label and grab a bite to eat. I had until 21:00 to get back to the postal center to send off the package. It was 20:30 when I walked back in. I had two additional packages to mail off from customers who’d paid me in the mean time, and I handed them to her. Then, I handed her the four, preprinted, prepaid customs forms. Well, this threw her for a loop because this customs form when filled out by hand has six copies, two of which go to the post office (or so I gather). I tried to explain that the post office already knows about the package because they’d already been paid. However, she would not hear anything of it and called her boss. That was fine with me because this way, I’d have a better chance of getting things done properly. From what I heard from my end, the lady’s boss wasn’t that knowledgeable but did manage to figure out that there was no problem and that the old lady should just pack three of the four forms (the forth I got to keep). I again tried to explain why I wouldn’t need the additional two forms for post office notification weren’t needed, but her frown shut me up. A brick wall that thick cannot be penetrated. Hi! I want to say, that I find you attractive. If you are for real, then I would like to know your story. Let develop a friendship. Who knows what may blossom from the seeds of friendship?.. This entry was posted in Uncategorized on September 5, 2007 by AstroNerdBoy.